Tamales, it’s been too long! 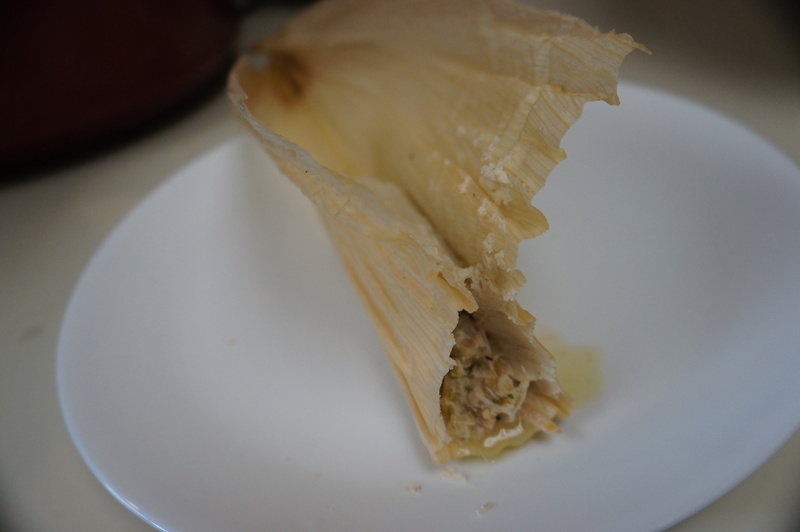 As promised, I’m going to show you my homemade tamales made with garden fresh green salsa. I can’t take credit for this recipe; my source is “Simply Mexican” by Lourdes Castro. Let’s get started. I froze a portion of the salsa I made last time and I made sure the portion was the amount I wanted to use for this recipe (so none would be wasted). I pulled the salsa out to thaw and then began poaching the chicken and hydrating the corn husks. I poach the chicken the same way I start a chicken soup. You place the chicken in the pot and just barely cover it with cold water which will make the broth more flavorful. The same principle is followed when adding vegetables. I also placed quartered onions, oregano, and garlic cloves in the water and made sure all the ingredients were just covered with enough water (1/2-1 inch of water above ingredients). If you are using the stove top, you’ll bring the water to a boil and then reduce heat to simmer for 35-45 minutes. If you have plenty of time, you could simmer it for several hours but never bring it to boiling for a more flavorful broth. I personally used a pressure cooker which allows me to skip those technicalities (pressure cooking does wonders) so alternatively I set the pressure on for 20 minutes then let it slow release. After the chicken is cooked through, let it cool in its broth to retain moisture. Then you can shred it with two forks, a kitchen aid stand mixer, or your hands. 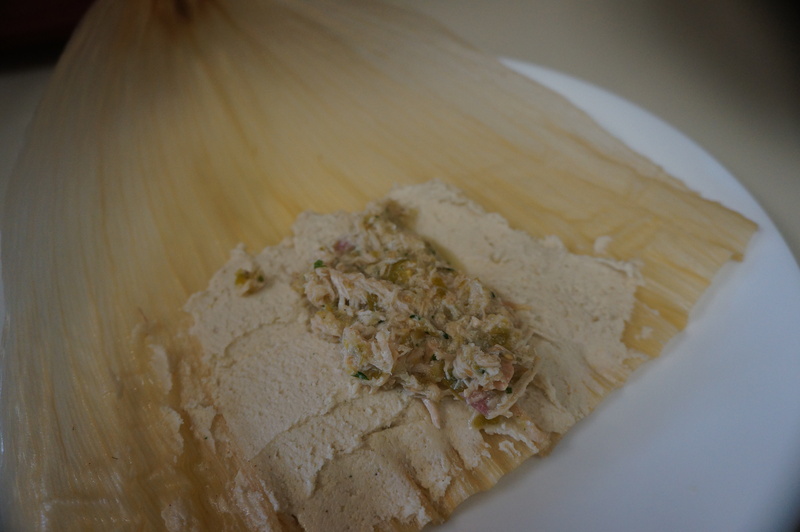 Reserve the leftover broth for your tamale dough. Stir the shredded chicken and salsa together making sure you have just enough to coat the chicken (set aside extra chicken if you need to). 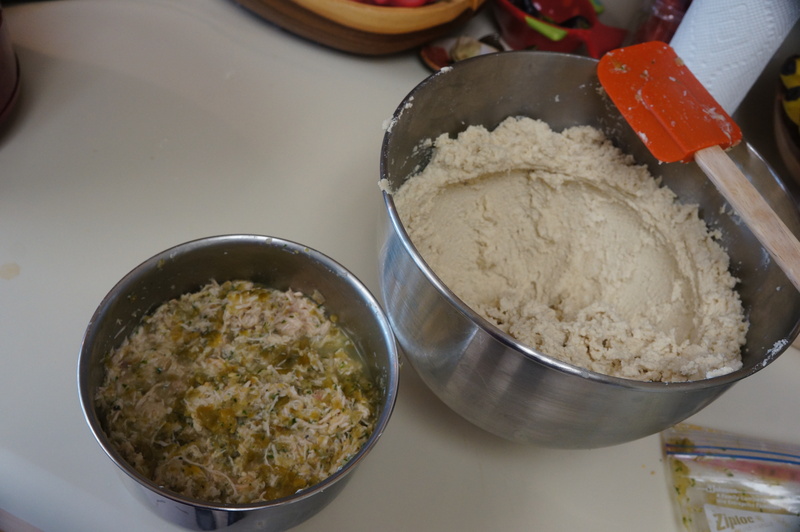 Set this mixture aside and make your tamale dough by first mixing together the masa and chicken broth; then beat the vegetable shortening separately until it is fluffy. Add a little bit of the masa mixture to the shortening a little at a time until all is incorporated then just add a couple more table spoons of broth and beat for 10-15 minutes. Sprinkle baking powder and salt over the dough and mix in. Now here comes the fun part (tedious part, the part that reminds me why I only do this at Christmas). You’re going to assemble the tamales. Are you ready? First take a corn husk and hold it with the narrower pointy end up. 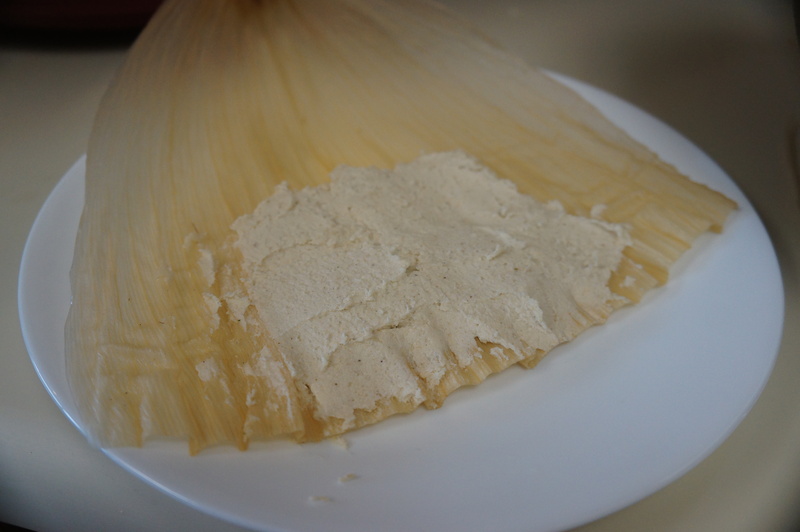 Spread tamale dough all over the bottom half of the husk leaving a one inch border on the left and right sides. Put some chicken filling lengthwise down the center of the dough. Pick up the sides of the corn husk and carefully press the edges of dough together. 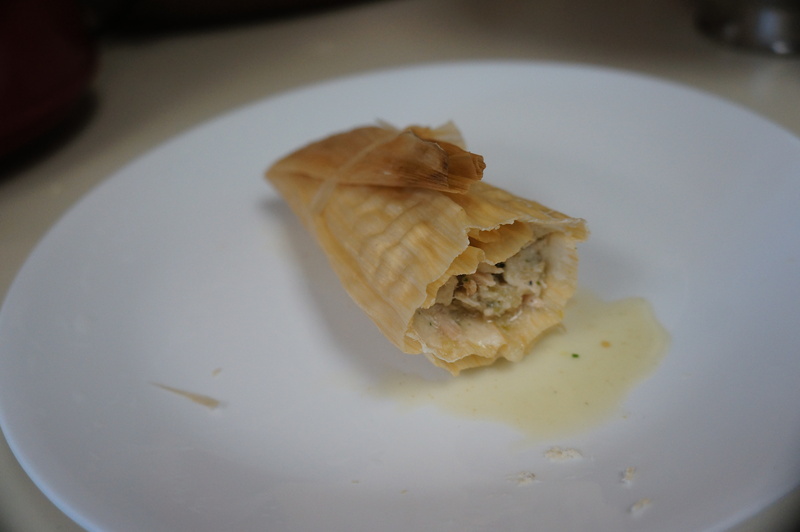 Fold the remaining flaps over to one side, fold the empty top section of the cornhusk on top of that, and tie a thin strip of extra corn husk around the tamale. 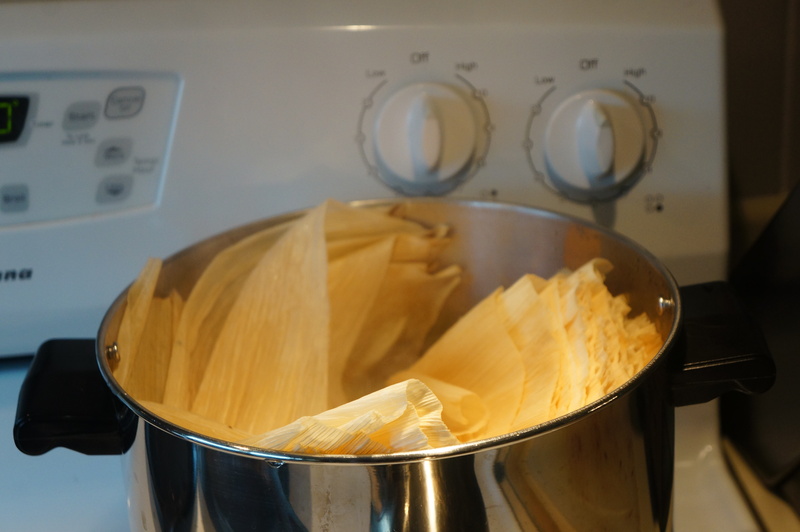 Once you have assembled all of the tamales, you can create a steamer with the foil, water, and pot. Just make a big ball with the foil, place it in the center of the pot, and add ½ inch of water to the pot. Stand the tamales around the foil ball with the pointy ends up. Cover the pot with a lid and let simmer for 40 minutes. 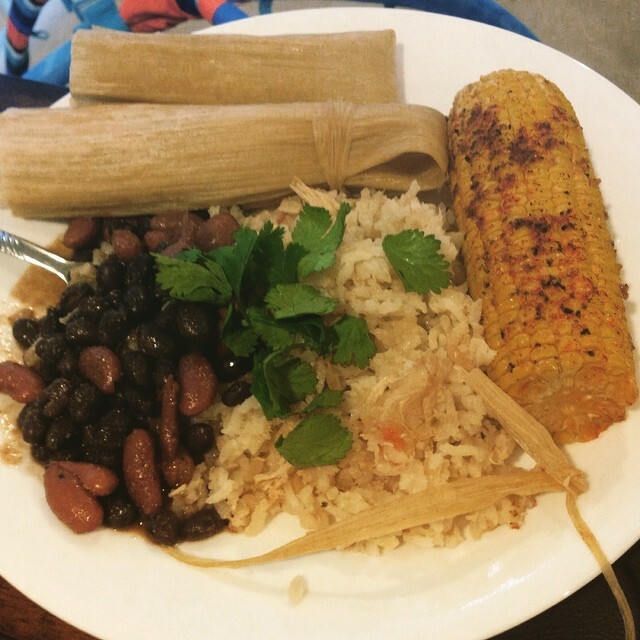 Your finished tamales should then be ready to enjoy with rice, beans, and perhaps some extra salsa and another favorite Mexican side dish. Mmmmmm, Muy Bueno! Previous Post Long Awaited Tomatillo Salsa! Next Post Grow Your Own Salad: It’s Easier Than You Think!